Mr. Brantley’s comment came when he gave an exclusive update to the Department of Information on September 29, 2014 from London where he is heading a delegation from the Nevis Tourism Authority (NTA). 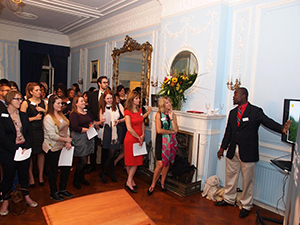 Earlier that day, the NTA in conjunction with the St. Kitts Tourism Authority (SKTA), hosted at least 40 leading travel agents at a cocktail reception at the office of the High Commission of St. Kitts and Nevis as part of the second annual “Know the U.K., Grow the U.K.” marketing trip, organized in partnership with British Airways. 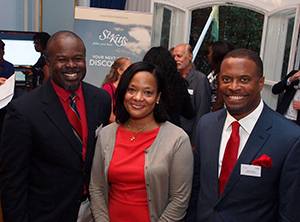 Nevis was represented by Minister Brantley; Chief Executive Officer of the NTA Greg Phillip; Julie Claxton, who is in charge of the U.K. and European market for the NTA and Sponge Marketing, the London-based firm which handles marketing and public relations for Nevis. Several hotel properties and tourism-related service companies, including the Four Seasons Resort, Nisbet Plantation Beach Club, Oualie Beach Hotel, Montpelier, Hamilton Villas and Spa and Mount Nevis Hotel, were also represented. According to Minister Brantley, “the attentive audience was thrilled to hear that Paradise Beach (formerly Villa Paradiso) situated along the scenic Paradise Beach in Nevis will have a grand re-opening in December 2014, offering ultra-luxurious three and four-bedroom villas plus concierge and butler services with private chefs and an exclusive beach bar. St. Kitts was also well represented with their delegation led by the Chief Executive Officer (CEO) of SKTA Raquel Brown and several leading properties and allied services there, including The St Kitts Marriot Resort and Casino, Ocean Terrace Inn, Kittitian Hill, Sugar Bay Club, Ottley’s Plantation, YU Lounge and Dreamy Weddings. The delegation travelled to Glasgow, Scotland on September 30th where meetings and presentations for travel agents, tour operators and travel writers were held. While in the United Kingdom, Nevis’ Tourism Minister is also expected to meet with several travel writers and journalists, meetings which he hopes would generate positive press for Nevis.